Sounds of the islands, produced with beautiful appointments and priced for anyone to own. 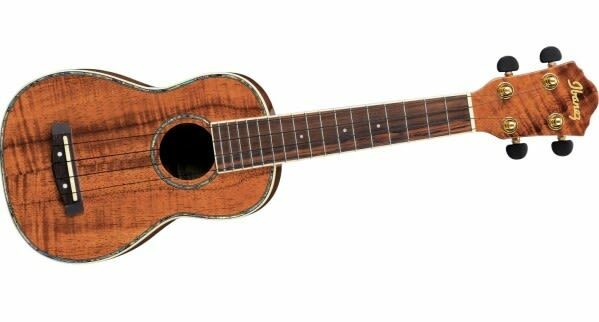 The Ibanez UKS50 soprano ukulele is a sweet-toned, nylon-stringed instrument with luxurious Hawaiian tonewood and built to stand the test of time. Built on the Soprano platform and size, the UKS50 features a luxurious figured koa body, presenting that unmistakable warm koa sound. The rosewood bridge and fretboard provide clear sustain and let the lows and mids soar. The gold Grover die-cast tuners with black knobs offer precision tuning and keep the ukulele in key. Dressed in a natural high gloss finish, and featuring a desirable abalone rosette around the soundhole, the Ibanez soprano uke's natural beauty shimmers through, making it a 4-string of incredible looks and unmatched tone. The ukulele originated in 19th Century Hawaii. It gained great popularity in the U.S. during the early 20th Century, and from there spread internationally. 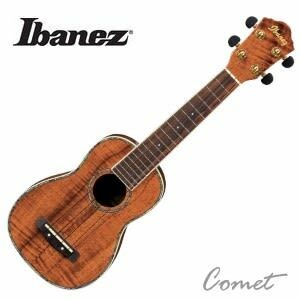 Ibanez ukuleles bring the rich, textured sounds of Hawaii (and more) to your fingertips. Includes gig bag.